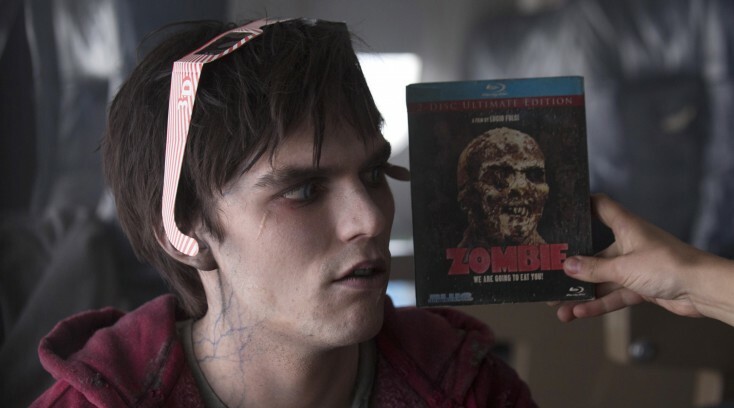 Hoult plays R, a young man struck down in the prime of life following some horrible apocalypse that turned him and others into zombies, destined to wander around a desolate airport in search of “food,” which is to say live humans. The remaining humans live in a faraway fortified bunker, where they live in fear of their former loved ones. The very private young actor with piercing blue eyes and a buzz cut isn’t about to dish on his recent split with longtime girlfriend and “X-Men” co-star Jennifer Lawrence, but he is keen to talk about his new movie, how his Halloween costumes have turned out as a predictor of future roles and what’s ahead. Q: Was it fun playing a zombie? Hoult: It was. It was one of the most fun experiences I’ve had working on a film. Jonathan Levine created the best atmosphere and is a top guy to work for. He’s very enthusiastic and supportive. I enjoyed it. I didn’t have much dialogue to learn. I could just turn up, groan, stumble around all day and have fun. Q: Did you shoot this sequentially because your character has a subtle arc on his journey back to humanity? Hoult: No. In fact, we shot all the airport stuff at the end so it did flip around a little bit. That was one of the tricky things that Jonathan and I worked on. We dissected the script up a little bit into sections of developing undeadness. Q: Did you have a chart of zombieness to help you keep track of where your character was emotionally? Hoult: (He chuckles.) Exactly, we talked about how well he could talk at various stages. Occasionally, Jonathan would be like “too much zombie” or “not enough zombie.” It was kind of what I needed. Q: Had you always wanted to play a zombie? Hoult: It wasn’t on my bucket list but I do have this odd thing where my Halloween costumes seem to predict jobs that I do. It started the year before I got the gig on “X-Men,” I’d gone as Wolverine the Halloween before. I didn’t play Wolverine, of course, but I got a job (playing Beast) the next year. While I was filming “X-Men,” I went to a Halloween party dressed as a zombie, and acted like a zombie, and the following year I got this zombie film. There seems to be a slight pattern developing. This past year I went as FrankenLennon. It was the best I could find in Africa from the dress up shop. I was a cross between John Lennon and Frankenstein. I had the little glasses, a beard and big green hair and a painted t-shirt where all my internal organs are. Q: Did you bring a Yoko with you? Hoult: I didn’t, but I did speak with a slight Liverpudlian accent. Q: Does this mean you’ll be playing John Lennon soon? Hoult: (He laughs.) I don’t think so. Q: You had quite a lot of makeup to deal with every day to become a zombie. What do you think about or do when you had to sit in the chair for hours? Hoult: Luckily, when I’ve had long make ups to do, they make up artists have been very nice. (Makeup special effects artist) Adrien Morot and Kathy (Tse) would have on the TV. So we’d watch movies and documentaries and just hang out. It’s nice to have about an hour and a half after think about it and get mentally ready or afterwards to decompress. Q: Did the make up help you find the character? Hoult: Definitely. The make up and the costume—just the whole set and environment—were helpful. I was walking around the hotel, not when (other guests) were around, and I’d practice the zombie shuffle. You’ve got to practice somewhere. I’d be in my own clothes and without the makeup, so it was kind of weird. It’s a lot easier (shuffling) on set. Q: Why does your character woo Julie with old records from the ‘80s? Hoult: He likes vinyl because it’s more alive. It has more soul to it. Q: Did you have any say in the music? Hoult: No. Jonathan is up on his music and knows what’s cool. He did a good job on the soundtrack of balancing some of the older tunes with more contemporary music. Q: Is there a song that you use to woo a girl? Hoult: Not really. I like to listen to Al Green occasionally. It’s just good fun. Q: John Malkovich plays the leader of the humans, who doesn’t quite like you courting his daughter. Did he intimidate you? Hoult: Of course. (He laughs.) He’s John Malkovich. You’d be nuts not to be intimidated by him, but he’s very nice and easygoing and such an intelligent man. I think he was (starring in) an opera at the same time he was doing this film. He also was working on his new clothing line. He’s got a lot going on. Q: Did you feel like a slacker around him? Hoult: I really did. I was like, “An opera? Oh really? I’m going to see what they’ve got for lunch.” It was really a pleasure to watch him and see him do his thing. Q: Had you read the “Warm Bodies” novel prior to getting the role? Hoult: No. I got the script and then I read the book and really enjoyed it. It was a nice insight into R’s head. There are a lot of thoughts and musings going on in there. There was a whole world of the airport described in the book that couldn’t be in the film, unfortunately. Q: Speaking of the airport, was that a set or a real? Hoult: It was an abandoned airport called Mirabel. It was creepy. We worked a lot of times at night and it was kind of weird. You’d go off to find a toilet in this big deserted airport. Q: How did you find fighting the CGI zombies called the Boneys? Hoult: The stunt guys would dress up in grey Lycra suits and sometimes there would be nothing (to fight). It was the same way in “Jack the Giant Slayer.” They’d have a tennis ball there against a green screen, only it would be placed higher up. But I’ve got an imagination on me so I could just imagine what was there. Q: Are you escorting Jennifer to the Academy Awards this year? Q: Are you based here or still in London? Hoult: London. I have friends and family there. I just got back (to LA) two days ago. I had been in Africa for seven months (shooting “Mad Max: Fury Road”). That’s a long time to be there. Namibia. The desert. So it was nice to decompress a little bit and see some greenery. Hoult: We finished “Mad Max” just before Christmas so that won’t be out until 2014. Q: Does that pick up where “Mad Max Beyond Thunderdome” ended? Hoult: It’s that world but it’s developed and changed and moved on a bit. There’s not a direct correlation or a throwback. Q: Is it set in a specific year? Hoult: I think it’s set 50 years from now. Q: You’re going to be all grimy and dirty in that, right? Q: Is that why your hair’s so short now? Hoult: Yeah. It’s just growing back. Q: Are you going to let it grow out? Hoult: I’m doing another action film this year so I’ve got to try and get some hair back for that. Q: You’ve got “Jack the Giant Slayer” coming out soon. Hoult: Yeah. 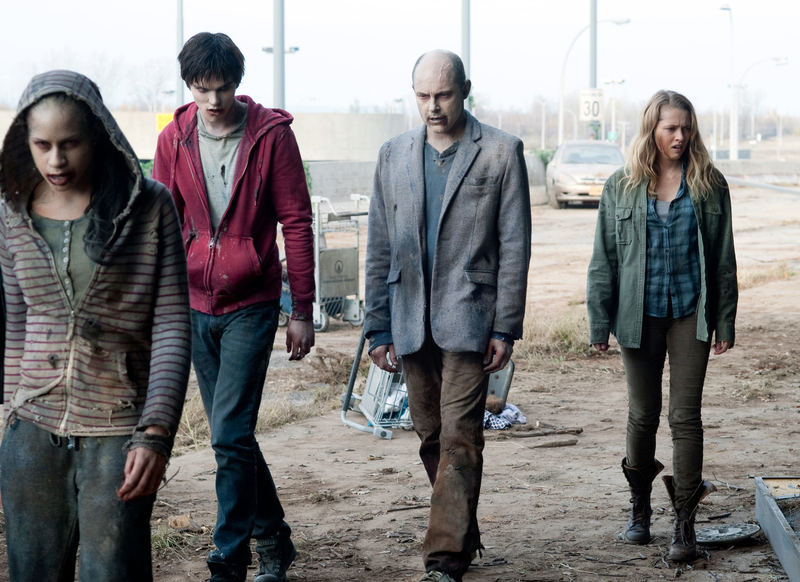 We shot that before “Warm Bodies,” actually. They’ve been doing a lot of work on the post-visual effects side of that. That will be out in March. I haven’t seen the finished product yet but I think they’re pretty happy with it. It’s a good family adventure movie. They’ve created a really fascinating 3D world. It’s visually pretty spectacular and the giants are amazing and they have great personalities. Q: Are you working on something now?